What will the future streets of Los Angeles look like? And what sorts of innovations, interventions, infrastructure, interconnections, and events will help us get there? And can we get there in a way that is sustainable, grounded in community experiences, and does not displace residents of communities that have experienced historical disinvestment? Events like CicLAvia, Baumann argues, give us a common point of reference from which to begin to rethink how our city should be designed. Experiencing safe, car-free streets firsthand, he says, can help skeptics imagine a more bike-centric future. Rubbing shoulders with the diverse mix of Angelenos seen at CicLAvia can also help to dispel the myth that cycling is the purview of well-to-do hipsters. And seeing the extent to which cyclists at open streets events outnumber those commuting on a daily basis might make it easier for skeptics to understand the role protective bike infrastructure can play in emboldening those who are currently too afraid to cycle L.A.’s mean streets. 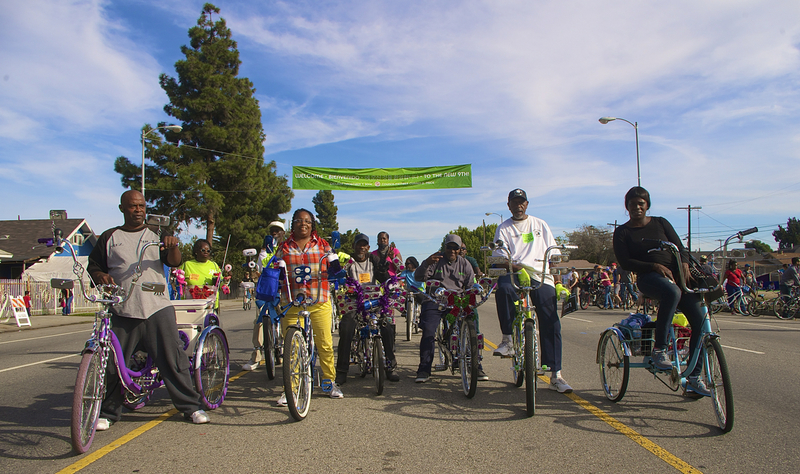 Members of the L.A. Real Rydaz and World Riders post up on MLK Blvd. during CicLAvia in South L.A. Sahra Sulaiman/Streetsblog L.A. Asking who benefits from infrastructure and how plans can be modified to be inclusive of existing residents and their visions of community may be important as we move forward, he says. “These will be the most challenging questions moving forward,” he concludes. While neither he nor the advocates featured in the video have answers to those questions, Baumann hopes that raising them in the video will add to the ongoing conversations about what a more people-centric future city might look like. If videographer Chidi Onyejuruwa’s cool drone footage of people riding through downtown offers any clues, that future looks like it could be really fun and harmonious. It is kind of a dilemma that if you make things “better” people could get displaced as more people are attracted to an area and bid up rents. Yet, if you don’t make things “better” don’t you just perpetuate long-standing patterns of underinvestment in certain communities? I think it speaks to the need for a comprehensive strategy for affordable rental housing involving more supply and dedicated affordable units; but that takes money and political will, two ingredients that are usually in short supply.